A Dark Brotherhood Assassin strikes. Sleep for any length of time, anywhere but the Seyda Neen Census and Excise Office, and there's a randomized chance of your sleep being interrupted by a Dark Brotherhood Assassin (possibly two, at higher levels). After at least one such attack, talk to any normal Guard to be directed to Apelles Matius in Ebonheart. 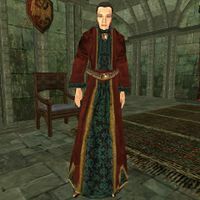 Speak to Matius about the Dark Brotherhood to be directed to Asciene Rane in the Grand Council Chamber in Ebonheart. Mention Transport to Mournhold to Rane to be teleported to the Royal Palace in Mournhold. Talk to any Royal Guard or High Ordinator in Mournhold to complete the quest. To start the Tribunal expansion content, simply use Rest (not Wait) for any length of time, and your sleep may be interrupted by masked Assassin from the Dark Brotherhood. The attacks are randomized, and the likelihood of one (as well as the level and, eventually, number of assassins) increases as your level goes up. Don't underestimate this leveled opponent, as he will have a good weapon and a decent amount of health. If you wish to sleep without being attacked and beginning this quest, use the bedroll in the basement of the Census and Excise Office in Seyda Neen. The attack script excludes that interior cell to avoid breaking character generation, and continues to exclude it after character generation is complete. If you want to trigger such an attack on purpose, you can simply use Rest for 1 hour repeatedly, while in the wilderness or at an inn. If you are too weak to kill the opponent (e.g., if you have just started the game but have also installed Tribunal), you can use Almsivi Intervention or Divine Intervention (you can find these spells, and scrolls and other items that provide them, in many places, including Arrille's Tradehouse at the start of the game) to escape by teleporting to another place. Recall/Mark can also be used. Luring the Assassin to a town doesn't work, as the Guards won't help you fight him. The Assassin will remain where you left him, so it is advisable to sleep in a place you are not planning to frequent, as these attacks always come while sleeping (and will interrupt sleep, preventing leveling and healing). The Assassin may spawn in another room if you have an interior wall at your back, and will not become hostile towards you until he sees you. This is a good opportunity to prepare for the attack and more likely obtain the Carved Ebony Dart from the Assassin (e.g., by barging in and quickly using Paralyze). You will incur a Bounty if you are witnessed somehow attacking the Assassin before he is in combat mode against you (usually by using a strong Chameleon effect). The Assassin is capable of opening doors, if already aware of your presence, other than those that are locked or which trigger a loading screen. Once you've killed the first such Assassin, you receive a Journal note to find a Guard and inform him about this attempt on your life. This must be a normal Guard (Imperial, Great House, or Ordinator); you cannot use a special guard such as the Duke's Guards. The Guard will be amazed that you survived the attack, and will advise you to speak with Apelles Matius in Ebonheart. If you put off this visit, you may be attacked again and again when you sleep. Once in Ebonheart (southeast of Seyda Neen and south of Vivec's Hlaalu Canton), any normal Guard should be able to tell you that Apelles can be found "wandering the battlements" close to the main castle (he is actually on the stairway to the bridge from the outer buildings to the main keep). Find him and ask him about the Dark Brotherhood and the conversation will quickly lead towards the mainland of Morrowind. Apelles will tell you to speak with Asciene Rane about transport to Mournhold, the capital of Morrowind. Asciene can transport you to Mournhold. This mage can be found in the Grand Council Chamber in Ebonheart, just to the right of the front entrance in the main hall. Ask her about Transport to Mournhold and tell her that you've been "marked by the Dark Brotherhood" to be teleported to the Royal Palace in Mournhold. To travel back to Vvardenfell, speak to the Argonian Effe-Tei in the same entrance hall where you arrive. This fast travel is specially scripted, and is not the same as normal Guild Guide travel; it works on the player character only, and cannot be used with companions like Fjorgeir, the Shock Centurion, or Calvus Horatius. Talk about the Dark Brotherhood to almost any Guard in Mournhold after your arrival there. Though the entry says you're supposed to talk to a Royal Guard, a High Ordinator will also work (a Hand of Almalexia will not). Increase (if necessary) the Guard's disposition to at least 40. You'll get a new Journal entry, which completes this starter quest. This does not finish your involvement with the Brotherhood. The Guard tipped you off that the Brotherhood may be hiding in the sewers under the Great Bazaar. This will set you on the path for the later quest Hunt the Dark Brotherhood, another part of the Tribunal Main Quest, which will lead you to their base and boss. You can begin it at any time, but completing it is challenging. The conditions for being attacked in your sleep differ between the PC and Xbox versions of the game. In the PC version, you can be attacked at any time, even when you sleep for the first time after starting a new game with Tribunal installed. In the Xbox version, you will only be attacked after you have reached level 6. The attacks will stop once Apelles Matius tells you to speak to Asciene Rane,[verification needed — see talk page] though the quest will stay active in your Journal until you talk to a Mournhold guard. 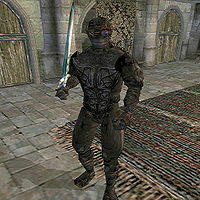 Exploit: If you sleep in the Balmora Guild of Fighters bedroom, between the bunkbeds and facing one of them, then the Assassin will spawn standing in the middle of the bunkbed behind you, unable to move or fight back. You may have to use an area-of-effect attack to kill him, if he spawns deep enough inside it that you cannot hit him with a weapon. After you have first traveled to Mournhold, Apelles Matius is no longer essential to any quests (and some players kill him for his Adamantium Armor). Nevertheless, his death will still bring up the essential NPC warning message. On Xbox, after speaking with Apelles Matius in Ebonhart, it may be impossible to enter the Grand Council Chambers. Opening the door or using Recall will freeze the game once the "Loading Area" progress bar is full. ? Saving the game after talking to Matius, restarting your console, then entering the Grand Council Chambers should fix the problem. 10 An attempt was made on my life as I tried to rest. I do not know who wishes me dead, but the attack should probably be reported to a guard. 20 One of the assassins had an odd dart on his body, the look of which I've never seen before. 30 A guard has told me that my attackers were likely members of the Dark Brotherhood, and that I have been targeted for assassination. He suggests I speak with Apelles Matius in Ebonheart for more information. 40 Apparently, the Dark Brotherhood does not have a large base of operations here on Vvardenfell, but has a very large contingent in Mournhold. Due to the Blight, no residents are allowed to travel to the capital city, and all visits are made only by the special order of Duke Dren. 50 I've been told to speak to Asciene Rane in the Grand Council Chambers about transport to Mournhold. 60 Asciene Rane has agreed to transport me to Mournhold. If I wish to return to the mainland, I should speak to Effe-Tei, an Argonian Mage in the Royal Palace. When I arrive, I should speak with one of the Royal Guard for more information about the Dark Brotherhood. 100 Finishes quest I've been told that the Dark Brotherhood is rumored to have a base in the ruins of Old Mournhold, accessible through the sewer system in the Great Bazaar. I've been warned that I enter there at my own peril. This page was last modified on 25 February 2019, at 18:28.